​BMW Investing $1B In Mexico Plant For Tariff-Free Access To U.S.
BMW is building a factory near the central Mexico city of San Luis Potosi to limit its dependency on expensive German manufacturing, avoid paying U.S. tariffs, and keep the UAW away. And it's only going to cost them around a billion dollars. The plant is set to open in 2019, with 1,500 workers at first and a capacity of 150,000 vehicles. But BMW isn't saying what vehicles will be built there. 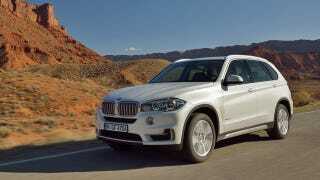 Considering the U.S. is BMW's second largest market after China, think volume models and SUVs. This latest foray into manufacturing south of the border comes a few days after Daimler announced plans to bring some Mercedes production to Mexico, partnering with its new besties at Nissan, which already has two plants in the country. But more than anything, for BMW this is a renewed bet on the U.S., which includes another $1 billion of investment to boost the output of its Spartanburg, S.C. plant by 50 percent.